More than any other age group, seniors need the proper nutrients in order to maintain their health and feel the best they possibly can. A healthy diet provides a wide array of benefits, like stronger bones and teeth, building cognitive function, helping with digestion, and maintaining all systems of the body so they are working as they should. A well-balanced diet can also help seniors reduce their risk for infections like the flu or the common cold, plus lower the risk for heart disease, stroke, osteoporosis, type 2 diabetes, and more. This is why proper nutrition for seniors is one of the best ways to promote better health among older adults. Eating a proper diet is essential at any age to stay healthy, active and at an ideal weight. However, as part of aging, changes in seniors’ eating habits and nutritional needs tend to occur. Or, possibly illness or disability prevents seniors from preparing healthy meals on a daily basis. While it’s true that our metabolism slows down as we get older, a senior who has lost his or her appetite entirely is usually displaying signs of more serious health problems. Stick to a routine. Humans are creatures of habit and thrive on routine. Set a schedule for eating each day- even for snack times- to help increase appetite. Do some advance weekly planning. Choose one day of the week to plan your meals or snacks for the week. For instance, chop up veggies and divvy them up into plastic containers. Portion out some dried fruits and nuts the same way. Having easily accessible healthy snacks will keep you from reaching for prepackaged cookies or chips. Eat with others. Seniors tend to eat more when in a social setting. Whenever possible, plan to meet with other residents at your senior living community, friends or family members for a social meal. Spice things up. Changes in smell and taste are common in the elderly, so foods might become less appetizing or even lose their taste altogether. Try adding new seasonings like herbs and spices, vinegar or even lemon juice to meals instead of reaching for the salt shaker. Try new things. It’s also common for seniors to get stuck in a food rut, eating the same meals day after day. Don’t be afraid to incorporate new recipes or new snack options into your daily meal plan to give your appetite the boost it may need. Decrease portions while increasing nutrients. 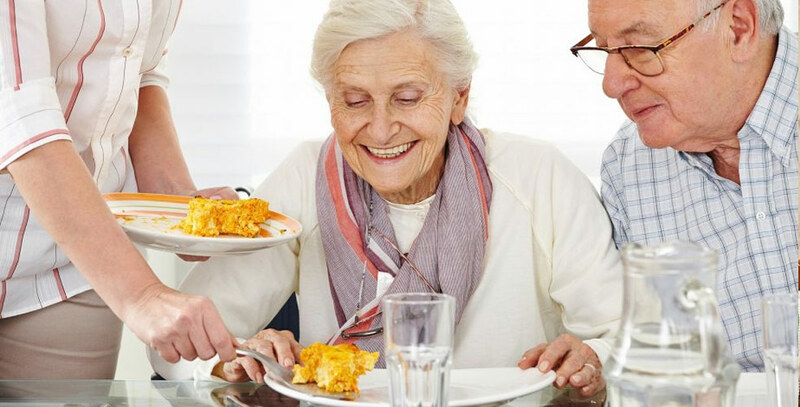 Seniors can easily get overwhelmed by a heaping portion of food on their plates. Instead of filling the entire plate full of food that may go to waste, incorporate more nutrients into smaller portion sizes, like adding peanut butter to whole-grain toast instead of butter on white toast. Treat yourself from time to time. Allowing for a small treat once in a while can keep a diet on track. Avoid overindulging, though, and instead opt for treats that are under 200 calories, such as dark chocolate or a handful of pretzels. For more information about senior housing options at Mountain Vista, please click here or call 303-421-4161 to schedule a tour.